In view of the amendment to the section 23 (2) of the Right of ‘Children to Free and Compulsory Education Act, 2009 in 2017, and in pursuance of the communiqué received from the Ministry of Human Resource Development, School Education & Literacy, Govt. of India about the mandatory completion of training by all in-service untrained elementary level teachers of Govt./Govt. Aided/ Non-Govt. Educational Institutions in the country within the extended period up to 31st March 2019, the Governor of Assam is pleased to notify the following guidelines for completing the training of untrained in-service elementary teachers in Assam within that extended period up to 31st March 2019. I. It is mandatory for all in-service untrained elementary level teachers of Govt. /Govt. Aided/ Non –Govt. Educational Institutions are to complete their D.EI.Ed training and acquire professional qualification within the proposed extended period up to 31st March 2019 through Open and Distance Learning (ODL) Programme of National Institute of Open Schooling (NIOS) who does not have requisite minimum professional qualifications mandated under the RTE Act, 2009. II. It will be the last chance for the untrained in-service elementary teachers to acquire the requisite minimum professional qualifications. Any teacher in Govt./Govt. Aided/Unaided–Private Schools, who will not have the minimum qualifications mandated under the RTE Act, 2019, would not be allowed to continue inservice beyond 1st April,2019 and the procedure for dismissal shall be initiated against such teachers. III. The primary teachers who have earlier acquired any other primary teacher education diploma/certificate of less than two years which is not notified to be at par with D. El. Ed. by the concerned authorities will also have to undergo the D. El. Ed. Course. IV. 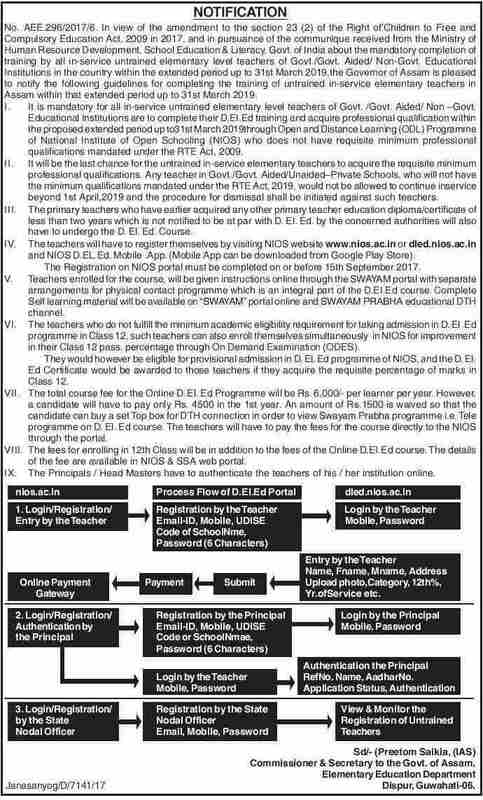 The teachers will have to register themselves by visiting NIOS website www.nios.ac.in or dled.nios.ac.in and NIOS D.EL.Ed. Mobile .App. (Mobile App can be downloaded from Google Play Store). The Registration on NIOS portal must be completed on or before 15th September 2017. V. Teachers enrolled for the course, will be given instructions online through SWAYAM portal with separate arrangements for physical contact programme which is an integral part of the D.EI.ED course. Complete self learning material will be available on SWAYAM portal online and SWAYAM PRABHA educational DTH channel. VI. The teachers who do not fulfill the minimum academic eligibility requirement for taking admission in D. El .Ed programme in Class 12, such teachers can also enroll themselves simultaneously in NIOS for improvement in their Class 12 pass. percentage through On Demand Examination (ODES). They would however be eligible for provisional admission in D. El. Ed programme of NIOS, and the D. El.Ed Certificate would be awarded to those teachers if they acquire the requisite percentage of marks in Class 12. VII. The total course fee for the Online D. El. Ed Programme will be Rs. 6,000/- per learner per year. However, a candidate will have to pay only Rs. 4500 in the 1st year. An amount of Rs.1500 is waived so that the candidate can buy a set Top box for DTH connection in order to view Swayam Prabha programme i.e. Tele programme on D. El. Ed course. The teachers will have to pay the fees for the course directly to the NIOS through the portal. VIII. The fees for enrolling in 12th Class will be in addition to the fees of the Online D.EI.Ed course. The details of the fee are available in NIOS & SSA web portal. IX. The Principals / Head Masters have to authenticate the teachers of his / her institution online. Last Date for Registration has been extended till 30th September, 2017.